Fifty-seven percent of respondents to PayScale’s Salary Survey have never negotiated for a higher salary, but not every non-negotiator accepts the salary status quo for the same reasons. When we dig deeper into the data, we see that tendency to negotiate varies based on factors like age, educational background, income, and geographic location. Let’s start with those happy folks who don’t negotiate because they don’t need to. Workers with high job meaning, high job satisfaction, and low stress were likelier to report that they didn’t negotiate based on being happy with their salary, compared to workers with low job meaning, low job satisfaction, and high stress. And if you’re looking to move to a place where you’re more likely to be happy with what you make, head to Vegas. The Las Vegas-Paradise, Nevada Metropolitan Statistical Area is the metro with the highest percentage of workers who have not asked for a raise because they have always been happy with their salary. 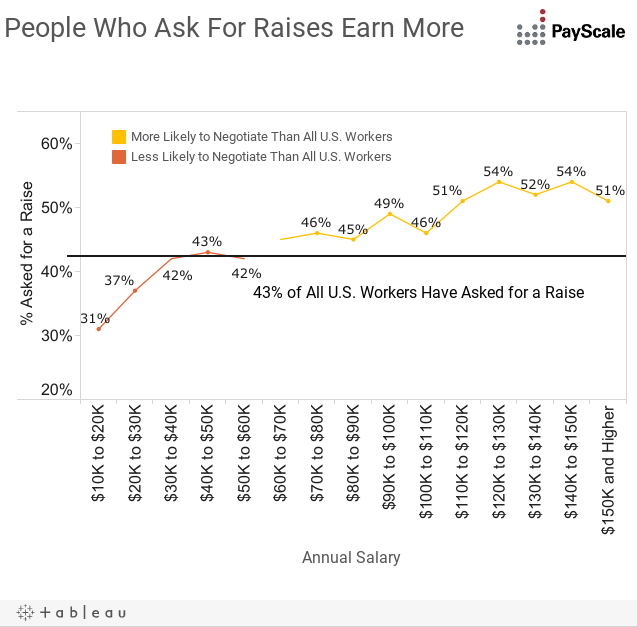 PayScale also saw a correlation between salary and likelihood of asking for a raise. Workers who made less than $60,000 annually were less likely than average (43 percent) to ask for more money; workers who made greater than $60,000 annually were more likely than average to negotiate. The $10,000 to $20,000 pay range had the lowest number of respondents who have asked for a raise (30 percent). Respondents who earned more were also more likely to get what they asked for. Workers who earned $150,000 or higher annually received the amount they requested 70 percent of the time, compared to just 25 percent of those who earned $10,000 to $20,000 annually. Older workers were less likely to be concerned about being perceived as pushy, compared to Gen Y workers. Twenty-three percent of Millennials have not asked for a raise because they don’t want to be perceived as pushy compared to 18 percent of Gen X workers and 12 percent of Baby Boomers. Millennials are also less comfortable with negotiating salary (30 percent) than Gen X (26 percent) and Baby Boomers (25 percent). Specifically, 35 percent of female Gen Y workers are uncomfortable negotiating salary (compared to 26 percent of male Gen Y workers). In general, there wasn’t a strong difference in salary negotiation history between genders as you might expect, considering the gender pay gap. Forty-two percent of females asked for a raise in their current field compared to 45 percent of males. However, women were more likely to have declined to negotiate based on feeling uncomfortable, with 31 percent of females selecting that reason, compared to 23 percent of males. Finally, despite those superior communication skills, English Language and Literature and Communication majors were most likely to not ask for a raise due to being uncomfortable negotiating salary (41 and 35 percent).